A pair of suicide bombers blew themselves up outside a 130-year-old Anglican church in Pakistan after the Sunday service, killing at least 78 people in the deadliest attack in recent history on Christians in the predominantly Muslim country. Explosions struck the historic white-stone All Saints Church in the city of Peshawar, near the frontier tribal areas where Islamist militants have their strongholds, as hundreds of parishioners, many of them women and children, streamed out of the building. “I heard two explosions. People started to run. Human remains were strewn all over the church,” said one parishioner, who gave only her first name, Margrette. Her voice breaking with emotion, she said she had not seen her sister since the explosions ripped through the area around the gate of the church enclosure. Interior minister Chaudhry Nisar Ali Khan said the death toll included 34 women and seven children. More than 100 people were wounded. “Who are these terrorists, killing women and children?” Mr Nisar said. The Taliban-linked militant group TTP Jundullah claimed responsibility within hours of the attack. “They are the enemies of Islam, therefore we target them,” said the group’s spokesman, Ahmed Marwat. Peshawar’s commissioner Sahibzada Anees told reporters the bombers struck when the service had just ended. “Most of the wounded are in critical condition,” Mr Anees said, adding special security had been in force to protect the church. “We are in an area which is a target of terrorism and within that area there was a special security arrangement for the church. “We are in a rescue phase and once it is over we will investigate what went wrong,” he said. Schoolteacher Nazir Khan, 50, said at least 400 worshippers were greeting each other when there was a huge explosion. “A huge blast threw me on the floor and as soon as I regained my senses, a second blast took place and I saw wounded people everywhere,” Mr Khan said. Grieved relatives gathered outside the church and shouted slogans against police over the security lapse. Islamist violence has been on the rise in Pakistan in recent months, undermining prime minister Nawaz Sharif’s efforts to tame the insurgency by launching peace talks with the Pakistani Taliban. An assault of such scale and audacity could be a turning point for Mr Sharif after months of inconclusive efforts to engage the Pakistani Taliban in talks, offering him a cue to give in to the tougher approach backed by the military. The army, which keeps thousands of troops in the tribal belt, an area where insurgents are based, opposes talks with the Pakistani Taliban, saying previous attempts to bring the militants to the negotiating table yielded no results. Within hours of the attack, Mr Sharif had toughened his stance considerably, but fell short of calling for outright military action against insurgents holed up in tribal areas on the Afghan border – an option supported by Pakistan’s all-powerful army. “Such incidents are not conducive of peace talks,” Mr Sharif said in televised remarks. Mr Sharif strongly condemned the bombings. “Terrorists have no religion and targeting innocent people is against the teachings of Islam and all religions,” he said in a statement. Such “cruel acts of terrorism reflect the brutality and inhumane mindset of the terrorists”, he added. Mr Sharif expressed his solidarity with the Christian community and deep sympathies with bereaved family members. Christians make up about 4 percent of Pakistan’s population of 180 million, and tend to keep a low profile in a country where Sunni Muslim militants frequently bomb targets they see as heretical, including Christians and Sufi and Shiite Muslims. Attacks on Christian areas occur sporadically around the country, but Sunday’s assault, in a densely populated Christian residential area in the old walled city in Peshawar, was the most violent in recent history. In 2009, 40 houses and a church were set ablaze by a mob of 1,000 Muslims in the town of Gojra in Punjab province. At least seven Christians were burnt to death. 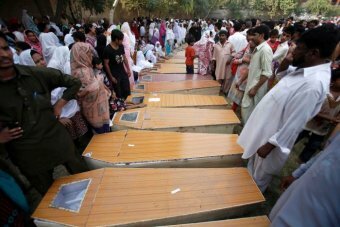 Seventeen Christians were killed in an attack on a church in Bahawalpur in 2001. Some residents, enraged at the lack of adequate security at the church, took to the streets immediately after the attack, burning tyres and shouting slogans. Shops were closed in the Kohati Gate area where several other churches are located. “Terrorists have not spared mosques, temples and churches. Please have mercy on us,” one man outside the church, his face distorted by fear and anger, told Pakistan’s private Geo television channel. Protests by Christians were also reported in other cities including Multan and the violent port city of Karachi. The attacks were triggered by reports of the desecration of the Koran.